This is one of those salads that comes into its own when you have a load of bits and pieces to use up in the fridge. You don’t need to use all of the ingredients I’ve used here – it all depends on what you have to hand. Cold potatoes, mushrooms, chickpeas, anything really. Heat a couple of tablespoons of vegetable oil in a frying pan and cook the cubes of bread for 3-4 minutes on a medium heat, stirring them as they are cooking until nicely browned; then transfer to some kitchen paper on a plate. Whisk all of the ingredients together for the dressing and season to taste. Season the sweetbreads, heat a little vegetable oil in a heavy frying pan and cook the sweetbreads for 3-4 minutes on a medium heat, turning them as they are cooking then add a knob of butter and cook for a further 2 minutes. Remove the sweetbreads with a slotted spoon and keep warm. Meanwhile, grill or fry the bacon in the same fat until crisp. Season the liver and fry in the same fat with a little more butter just for 2-4 minutes, keeping it pink, then remove and mix with the sweetbreads. 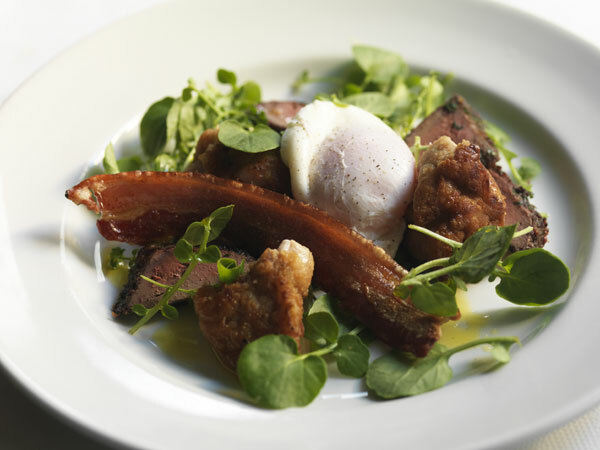 To serve, poach the eggs, arrange the winter salad leaves, offal and bacon on serving plates or in a bowl with the egg in the centre and spoon over the dressing. This entry was posted on March 13, 2011 at 9:59 am and is filed under Food with tags baby spinach, bittercress, bread, brunch, butter, cider vinegar, corn oil, dijon mustard, duck eggs, freshly, liver, pennywort, rapeseed oil, recipe, rocket, salad leaves, salt, streaky bacon, sunday, sweetbreads. You can follow any responses to this entry through the RSS 2.0 feed. You can leave a response, or trackback from your own site.